All 32 episodes from the third to sixth series of the BBC comedy drama set on the Caribbean island of Saint Marie. Following the death of his predecessor Richard Poole, D.I. 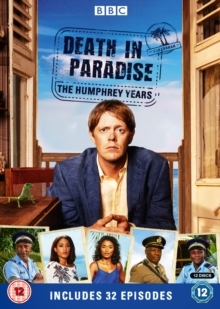 Humphrey Goodman (Kris Marshall) is appointed chief investigator and tasked with solving the various crimes that continually plague the idyllic island, with help from D.S. Camille Bordley (Sara Martins). Series 3 episodes are: 'Death of a Detective', 'The Wrong Man', 'An Artistic Murder', 'Ye of Little Faith', 'Political Suicide', 'The Early Bird', 'The Man With the Golden Gun' and 'Rue Morgue'. Series 4 episodes are: 'Stab in the Dark', 'Hidden Secrets', 'Damned If You Do...', 'Until Death Do You Part', 'Swimming in Murder', 'The Perfect Murder', 'She Was Murdered Twice' and 'Unlike Father, Unlike Son'. Series 5 episodes are: 'The Complex Murder', 'One for the Road', 'Posing in Murder', 'A Personal Murder', 'Lost Identity', 'Dishing Up Murder', 'The Blood Red Sea' and 'Flames of Love'. Series 6 episodes are: 'Erupting in Murder', 'The Secret of the Flame Tree', 'The Impossible Murder', 'Stumped in Murder', 'Man Overboard: Part 1', 'Man Overboard: Part 2', 'In the Footsteps of a Killer' and 'Murder in the Polls'.